One of my great loves, Design*Sponge, introduced me to this Small Stump + Studio Choo product. 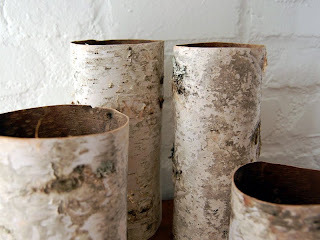 These lovely Birch Bark Tubes make stunning vases, each set of four ready to make an organically delicious vignette. You can use these delicate natural materials with a clean conscious - the bark is harvested from trees that have fallen from natural causes in Canada. 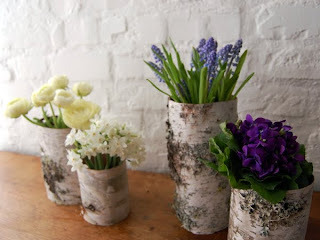 The wildly talented ladies of Studio Choo also design floral delights featured on their blog, Small Stump + Studio Choo.